Routehappy makes it possible to publish UPAs to our demo site, routehappy.com., in either private and public mode. Private mode makes the UPAs visible only to members of your team who have signed in using their Hub sign in credentials. 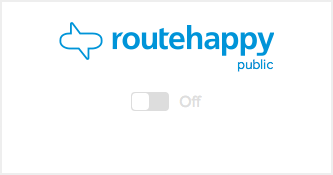 If you publish a UPA in public mode, it will be available to anyone visiting routehappy.com. Navigate to the Routehappy sign-in page and enter your Hub credentials. Click the “Details” button on the flight listing (if doing a route search). All published UPAs tagged with a standard category are rendered below the Flight Amenities. Note: UPAs published to Routehappy Private are visible only to members of your team. You can manage users from the team settings page (Super Users only). Grant access to Routehappy Public from partner access. Navigate to Routehappy sign-in and enter your Hub credentials. Click the flight listing (if using route search).